A good day frugalling for us today. I picked up a pair of brand new snow boots for $20 ($300 retail) at a garage sale, along with some sewing fabric at $1 a piece. But best of all, four Fowler's jars for $1.50 each at YMCA Belconnen. The Old Flame and I are loving bottling fruit, and these jars (long with the two TOF picked up for $1 each last week) are excellent additions to the working collection. 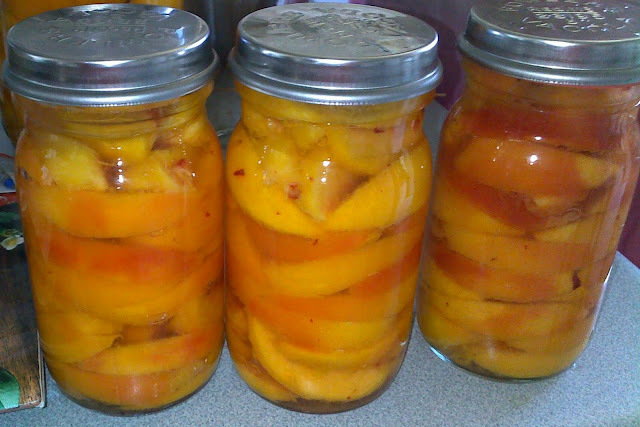 Anyone know of fruit or jars going spare? Happy to pick our own if your tree is overloaded and you don't have the time or inclination to deal with it. in the YMCA building in park on Meuller Street, Yarralumla. St Paul's Op Shop Manuka. An unplanned drop in to Vinnies @ Tuggeranong scored some lovely finds. I spotted the red floral fabric of the sundress through the window of the shop while I was getting put of the car. The dress along with the in the Jane Austin Handbook are for Sage. While the red 'looks like new' beauty case will replace my twenty year old sewing case. I have started collecting snoopy items to add to my mums 'Peanuts' collection - the Dear Mum mug made this purchase quite appropriate. There was some fabulous fabric made up into curtains - but at $80 for two, Vinnies priced me out of the second hand curtain market. During a camping holiday, I stumbled upon my new favourite gem- the Adaminaby Op Shop. The op shop has a large selection of clothes, shoes, books. A cursory glance at the back section showed men and children's clothing and handbags. Unfortunately I did not have enough time as I would have pleased... impatient travelling companion. 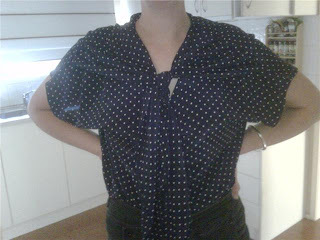 However, I did manage to purchase a fantastic tie front blouse.. $4. Fantastic. Not sure of opening hours however is open on a Saturday morning around 11am! Tinys' Green Shed at Mugga tip. I made a quick to Tinys' Green Shed during the week. He is still in the process of setting up so he has limited stock. However his prices seem reasonable, as he charged me $5 for an armful of stuff i was carrying and i heard I say $40 for a Fulton Sofa to another customer. As you are aware, some items that we find only have a limited localmarket here in Canberra. The items chosen for Ebay will stay in the shed for one week, with an estimated price on them. If you would like to purchase the item, you may do so at the estimated price. If you think the Estimated price is too high, then you are most welcome to bid on it on Ebay: Tinysgreenshed. If you are the successful bidder you may collect the items in person from Tiny's Green Shed. So Tiny is open about it. He will be selling the better bits on Ebay. This was a claim that was made against the previous Tip Face Salvage operators in Canberra, but I could never find any proof. I paid a visit to the Mugga Way tip shop, and saw this sign outside. I must put January 6 in my diary.